Enjoy Mobile Check Deposit? Thank a Soldier. In a world with ubiquitous smartphones, being able to access banking information through a mobile app has become table stakes for the banking industry. These days, most best-in-class banking tools also include a mobile check deposit feature. 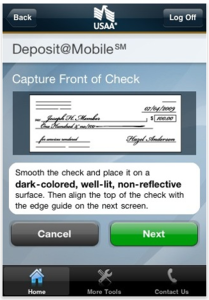 Mobile check deposit allows you to use the camera of your smartphone to take a picture of the front and bank of an endorsed check and securely send it to your bank. No waiting in line for the next teller, no awkward fumbling with the pneumatic tube carrier in the drive-through, no more shoving deposit envelopes into an ATM machine. Mobile check deposit is one of those advances in technology that delivers both true customer value and the feeling that we are one step closer to living like The Jetsons. Being able to deposit a check from anywhere in the world is convenient for everyone, but it was critical for the target audience it was originally developed for: the military. In 2009, USAA, a San-Antonio, Texas-based financial services company that serves the military and their families, needed a way for their many members that were deployed overseas to easily deposit money into accounts that were accessed by family members back in the States. There was just one problem: USAA only had one branch. As smartphone adoption increased, mobile check deposit became a feasible solution for helping their decentralized members help their families. Did USAA benefit from implementing this feature? Sure. Mobile check deposit allowed money to be deposited with speed and accuracy into their bank, enabling even more transactions to take place. But the real beneficiary were their members–who no longer had to deal with the frustration of waiting for checks to make it to San Antonio from bases all around the world. By understanding the unique needs of their customers, USAA not only created meaningful engagement in a Moment That Matters , they pioneered a revolution in online banking that created an opportunity for meaningful engagement for the entire financial services industry. Want to connect with your customers at the Moments That Matter, download our latest white paper on meaningful engagement. Have you experienced a Moment That Matters? Tell us about it on social media, using the hashtag #momentsmatter.